The digital summit is a new online education experience optimized for self-storage professionals. Each summit takes place live with real-time Q&A and is recorded for future distribution. 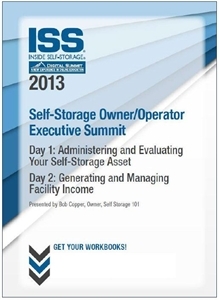 These DVDs contain copies of Days One and Two of the Self-Storage Owner/Operator Executive Summit, which took place on Oct. 16 and 17, 2013. They include all six education sessions recorded on the days of the events. Following is a description of the session contents. Also included with your purchase are two digital workbooks you can access in PDF format. Instructions for downloading your workbooks will be included with your DVDs. Prefer to buy these sessions individually? Click here to purchase the Day One DVD. Click here for the Day Two DVD.